I’ve always been the “cook” for our family dinners. I’ve never had any formal cooking lessons (the ones when we were kids don’t count), so I really don’t know what I do half the time. I wish I can say that my family has a simple palette, and that serving local dishes would suffice, but I belong to a family of very picky/particular eaters, that doesn’t give me much room to experiment (or try creative cooking). Family dinners are more difficult to create because they want to veer away from the usual staples we have at home with “fancy, restaurant-quality dishes” without having to dress up. 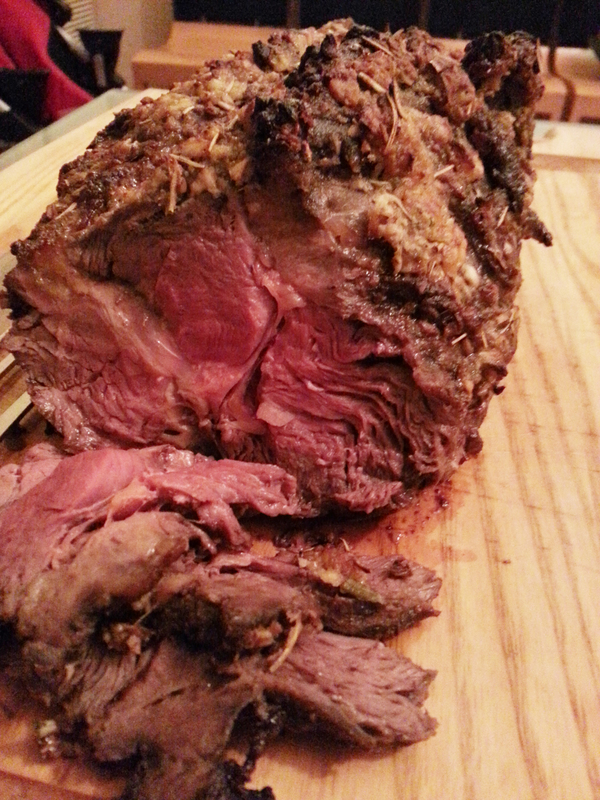 We’ve always had big chunks of beef in our family dinners. 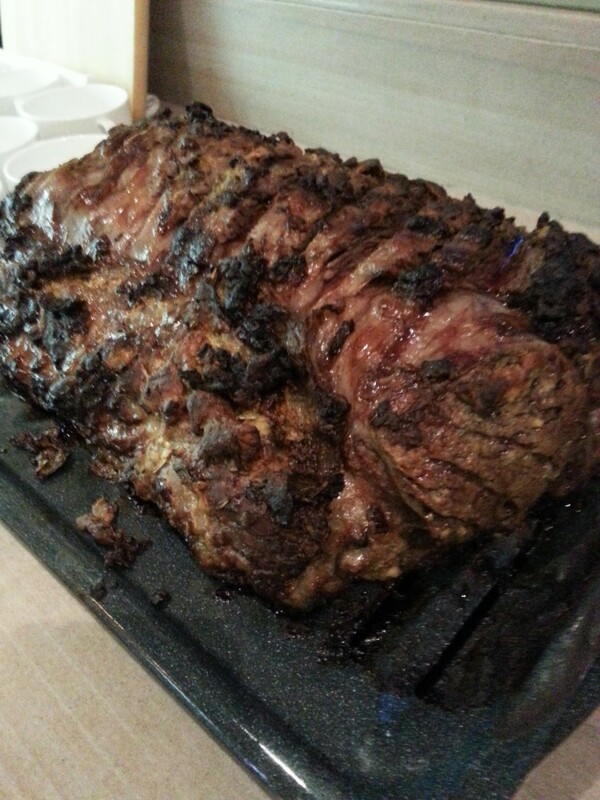 We’d either grill steak or order roasts from very reputable caterers, and after several attempts of making decent marinade for our roast beef (which includes saying a little prayer before putting in the oven), I’m proud to share the recipe with you guys. The proportions are for a 5kg (Yes, 5 kilos!) roast. I normally buy yearling from S&R, but ask your regular butcher for the softest chunk of meat available. 1. Peel onions and chop into quarters. Peel garlic. 2. Dump onions and garlic into a food processor (I don’t like chopping), and let it “process” until you get pencil eraser big chunks. 3. Add the mustard into the food processor, and after a few buzzes, add the olive oil, lemon juice, herbs, salt and pepper, until you get a chunky paste. 4. Generously slather all over your roast, even in nooks and crannies and cracks in between. It looks like one great big yellow goop, but it will look and taste great after roasting. 5. Wrap in plastic and store in freezer. Remove from freezer approximately 6 hours before roasting to thaw. 6. Preheat oven to 350-400 degrees Farenheit. 7. Say a little prayer and put the roast in the oven. Since I’m paranoid android, I check after 40 minutes to see if everything is going smoothly. It will give a nice medium rare after 1 1/2 hours. This site is useful in finding out exact measurements, temperatures and cooking time. The marinade with create a nice burnt crust and the keeps all the juices locked in. This is the first roast I made with this marinade. Whopping 5kgs! So far my family approves of this type of roast. I hope you guys enjoy!